The system allows operating one receiver (window with motor, Venetian blind, internal or external blind) by means of a single channel controller (ZWG1 wall keyboard). By applying this solution, it is also possible to achieve the operation of several (the same) receivers. 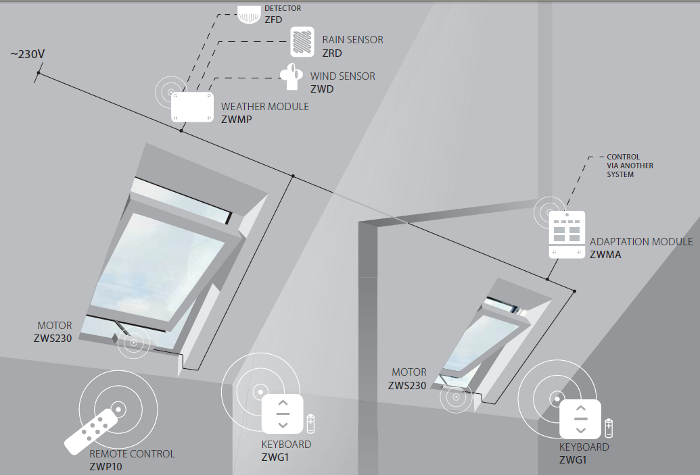 By using the ZWP10 remote control, it is possible to operate both single device and many devices at the same time. With a single wall switch and remote control, it is possible to operate up to 231 receivers simultaneously. Connecting the set consists in supplying 230V AC power to ZWS230 motor with a 2x1mm2 double-core cable. Weather sensors are connected to the ZWMP module with the following cables: ZRD 3x0.5mm2, ZWD 2x0.5mm2. The length of the cable depends on individual customer needs. A detailed wiring diagram is described in the fi tting instructions for electrical accessories. The ZWG1 controller is attached to a wall or other fl at surface by means of screws included in the installation set or double-sided adhesive tape. The ZWG1 controller can also be positioned in other places thanks to the fact that they are powered by a 3V DC battery.